Today is a special day. I have been waiting six months for this moment, and every time I thought about it I savoured the moment in my mind. 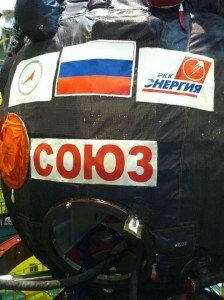 Today is the first day I will enter my Soyuz. It really is mine, it was built exclusively for my flight and it has seat fitted to my body – I know every detail by heart, and I can find every single button, every lever and every valve inside even with my eyes closed. Although it is the first time that I will enter this spacecraft, I have spent hundreds of hours training in a simulator that is identical to the real spaceship. The word spaceship makes my mouth water but people thinking of an X-wing fighter or Star Trek vessel will be disappointed. 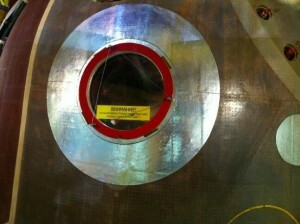 The Soyuz is a solid and secure capsule which has flown hundreds of times and it does not look futuristic. Her beauty is of the rough, mechanical kind. It looks more as how I imagine a mini submarine to be. In my eyes though, it has the aggressive curves of a Formula 1 car and the captivating charm of a superbike. 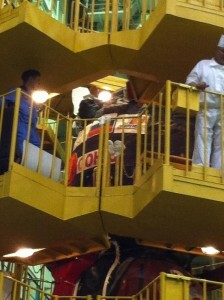 As co-pilot, I am privileged, we are the first to enter the capsule and, if I may say so, take charge of the spacecraft. I admit that I feel strong emotions when I drop down from the habitation module БО (pronounced Bee-Oh), through the airlock and into the command module CA (pronounced Ess-Ah). In just a few days, that are approaching rapidly, the 09M will take me into Earth orbit, and then on to the International Space Station! I take position, and it immediately feels familiar. Everything is powered-off but I know that behind those dormant panels of the Нептун (Neptun) control panel, lies the heart and brain of the KC-020, the analogue reentry computer. 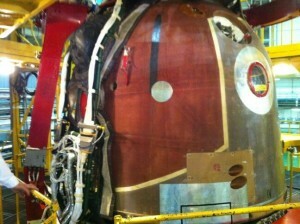 Soon they will be illuminated, and the capsule will come to life. Once again I am surprised at how familiar everything feels. Together with crewmates Karen and Fyodor we check every detail. We are wearing our normal flight suits as they allow more freedom of movement than the Sokol suits we will use during launch. Everything is in perfect order, and after only 45 minutes we are ready to climb out again. While the backup crew does their check of the spacecraft, we start putting on our Sokol suits. 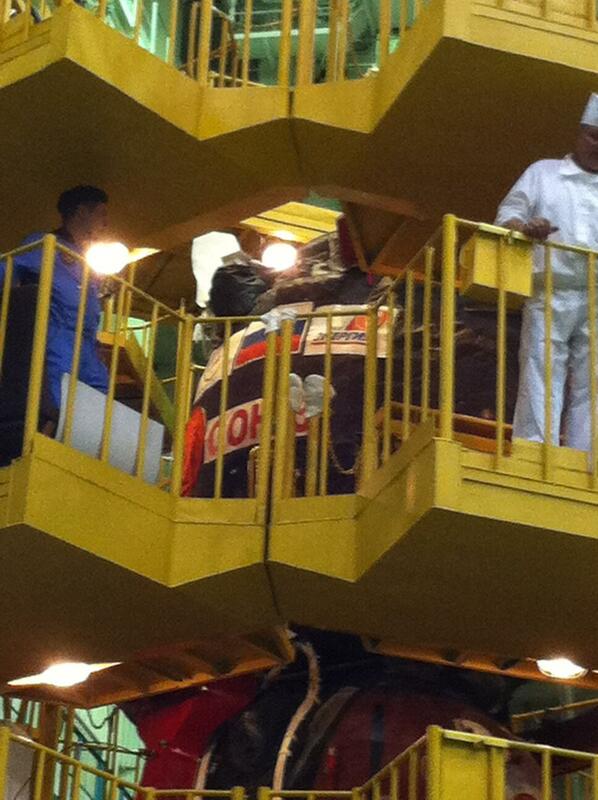 An hour later I am once again the first to descend into the capsule and settle in my seat. A technician ties me down and tightens my harness that consists of a four-point belt and two straps to lock my knees in place. After 20 minutes the three of us are ready: on Fyodor’s command Karen activates the general control panel, and Fyodor and I activate our computers in sequence. 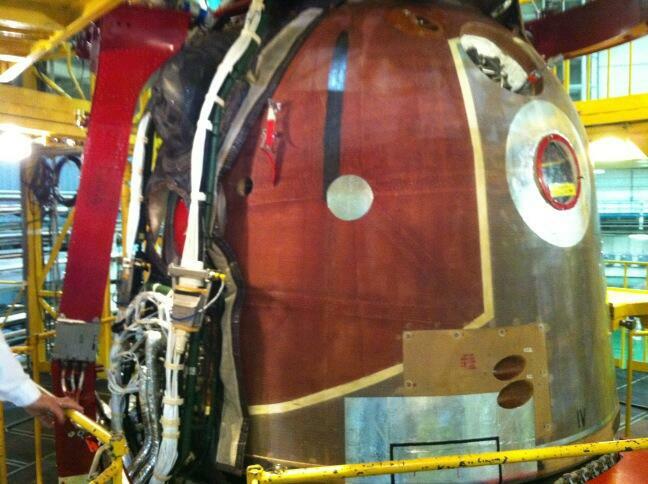 The Soyuz comes to life, and we begin radio tests followed by some normal checks. While I am strapped in I check to see that I am able to reach all controls. It is more difficult to communicate now because of survival equipment installed around and above us. I cannot see Fyodor and I cannot move as I am tied down in my seat. I have to concentrate to follow his instructions. All in all the checks last about an hour and a half, and my legs begin to feel tired. The last check involves lifting the seat that dampens the impact upon landing back on Earth. Once this test is done we turn everything off and the technicians pull out Fyodor and Karen. For a few minutes I am alone and in total silence. Although it is uncomfortable sitting here I try to memorise every feeling and every thought – I will not have another opportunity: next time I sit here in my Sokol suit it will be time for lift-off. Congratulations on your Upcoming Mission. We’re all looking forward to Following You during your time on the ISS. Buon viaggio a te Luca e a tutti i tuoi compagni di questa ennesima grande avventura umana!!! Ogni volta quando posso, dopo che la NASA manda la mail con oggetto SPOT THE STATION, con ora e posizione della ISS, alzo gli occhi da Lucca e vedo quel puntino luminoso apparire e sparire dopo un pò.